Okay, we have to post one more entry in this ever-lengthening build log, for a couple of reasons. First of all, our application to the 2019 Bay Area Maker Faire has been accepted, based in part on our tacit agreement with the organizers to promote the event here on our website. So consider yourself promoted. The event takes place at the San Mateo County Fairgrounds on May 17-19, and should be fabulous with or without our participation. As usual we'll be in the area with all of the electric vehicles, staunchly defending our unpopular decision to power the Locost with a conventional gasoline engine. Our second reason for posting this entry is to inform the public that we managed somehow to complete one of the two remaining tasks on our long-term Locost build that we've been promising to do for the last several years. 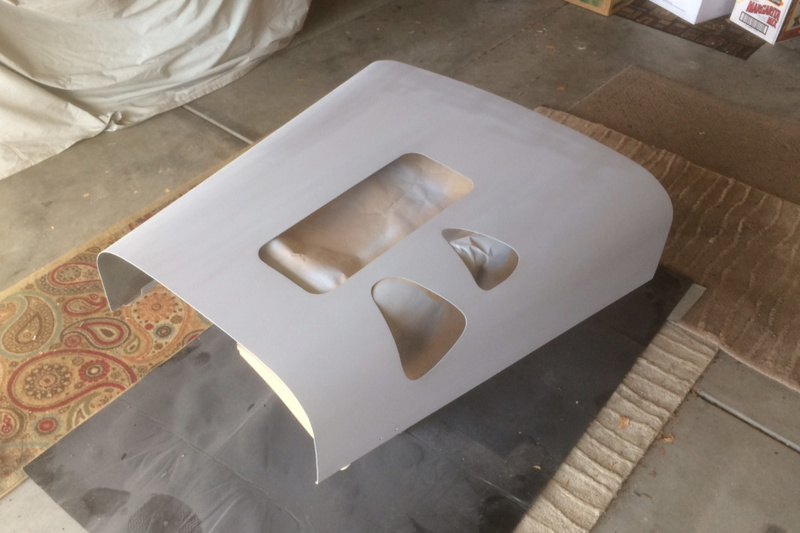 This task, as you may have already guessed from the pictures below, is painting the bonnet, a.k.a hood. As a consequence of this we had to take a bunch of pictures, which as we've already noted you can see below. As usual we didn't take nearly enough photos of the actual work in progress, so the photos of the completed bonnet will have to do. 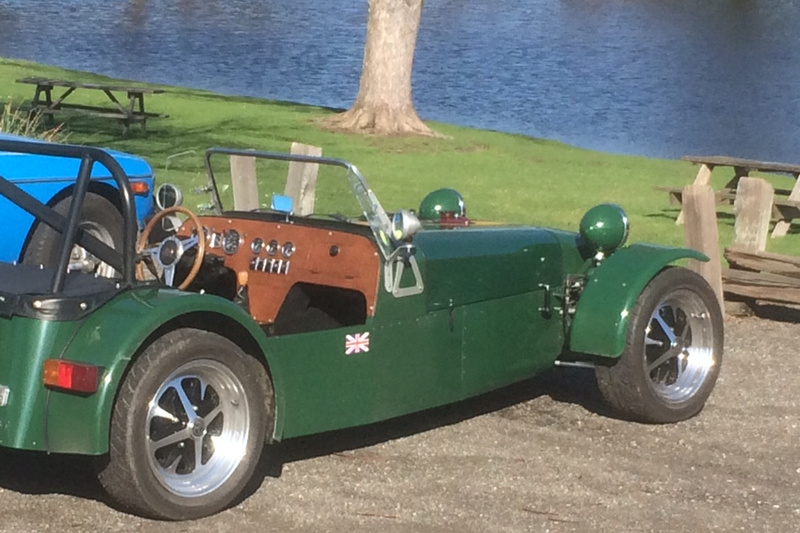 The bonnet that's on our Locost now is not the original, but rather a replacement we had to make a couple of years ago when the original flew off on the freeway and got run over by a truck. Not a great day in the storied annals of our Locost ownership. 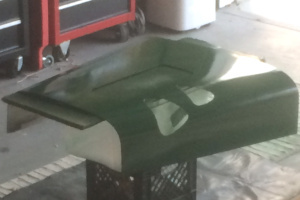 But the replacement bonnet actually turned out a little nicer than the original, except for the color. 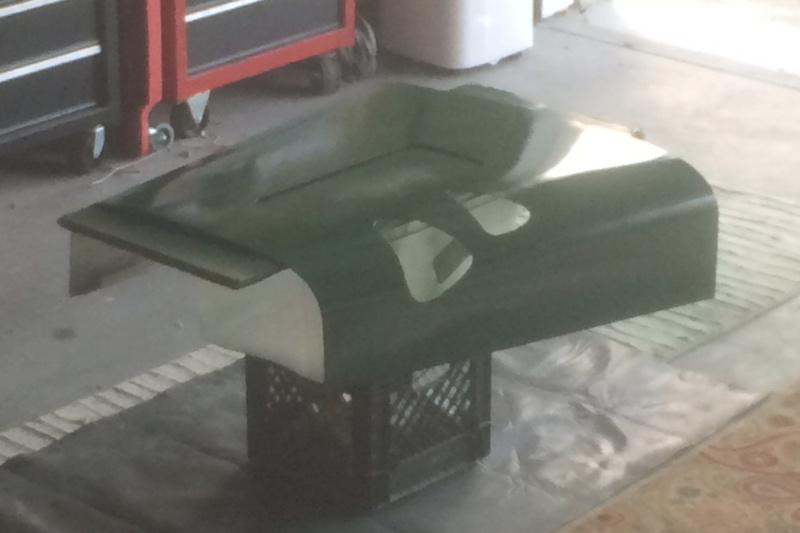 Being far too impatient to paint the thing and wait for the paint to dry, we temporarily wrapped it in a vinyl film that was close to the same shade of green as the rest of the car. The bonnet, however, not being a horseshoe or a hand grenade, was not happy with close. Although few people seem to have noticed the minor color difference over the past two years, it's only because they didn't get a good look at the car. We, on the other hand, see it every day. Not only was the vinyl the wrong shade of green, we could never get it to shine properly. The surface was smooth enough, and sort of reflective, but never glossy, not even after layers and layers of paste wax. It didn't help that the vinyl also got a little torn up over the years. 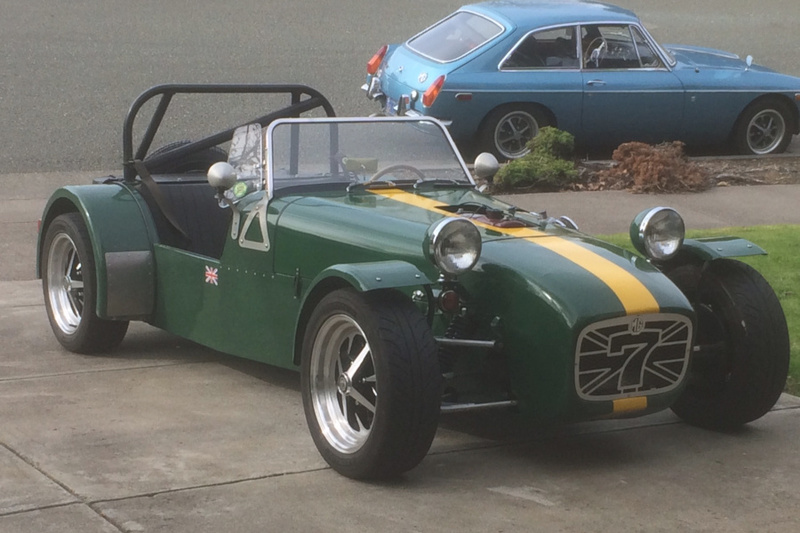 So we've had the bonnet on our list of Locost upgrades for a long time, along with the brakes, exhaust, and seat covers. The first two of these--brakes and exhaust--were sort of forced on us. We could've held off doing those indefinitely, if the brakes hadn't failed completely and the exhaust hadn't fallen off in the middle of the street one day. Those two we had to fix. The bonnet, on the other hand, ugly as it might've been, was doing just fine. We had absolutely no reason to paint it, and if we think back on it now, we don't have a clue why we did. It might've been curiosity. Just to see how easy it would be to peel off the vinyl. As it happened, not so easy. The glue on that stuff is amazing. Unfortunately, once we had a corner of the bonnet peeled away we were committed. It's not like we had a bunch of other things to do, but getting rid of the old vinyl took forever. After several days of chipping away at the green film with our fingernails, we finally got the whole bonnet back to bare aluminum. 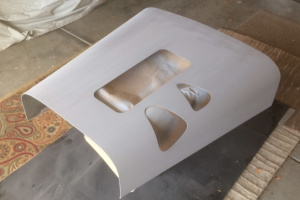 We then roughed up the surface with 320-grit sandpaper and sprayed on the first coat of Rustoleum gray automotive primer. Although sanding the bonnet seemed to work okay, it should be noted that we didn't sand our original bonnet. We etched it instead with a chemical called alodine. We didn't do that this time for a couple of reasons. First, you have to order alodine online, and it has a shelf life. If you don't time it perfectly to arrive at your house at the exact moment you're ready to prep your bonnet, it may not etch anymore. Second, it's a chemical that eats aluminum, so it may not be ideal for the plants and shrubs around your house. Third, it costs money, and not just a little bit. Sandpaper, while not cheap, is still the better bargain. As many of you know, we are not big fans of Rustoleum in spray cans. Their automotive primer is okay, not really high-build like Featherfill or similar products, but it sticks pretty well to almost anything and you can sand it within hours. So we're okay with Rustoleum primer. Rustoleum Hunter Green in a spray can, on the other hand, is vile stuff. While it's possible to get a glossy finish with it--we made it work on our scuttle and front fenders, eventually--you only get one shot at it. You have to get that perfect finish with the first coat. We didn't get a perfect finish with the first coat, at least by most people's standards. Ours are somewhat lower, though, so we're happy with it. The paint looks great in places but a little rough in others. Fortunately most of the orange peel is in the center of the hood, where the vinyl yellow stripe hides it nicely. You can still see a little of it poking out from underneath the stripe near the back, but the paint overall looks a lot better than vinyl. Most of the bonnet is actually glossy, and the best part is it's the exact same color as the rest of the car. It actually outshines the other panels slightly, but we're sure that won't last. 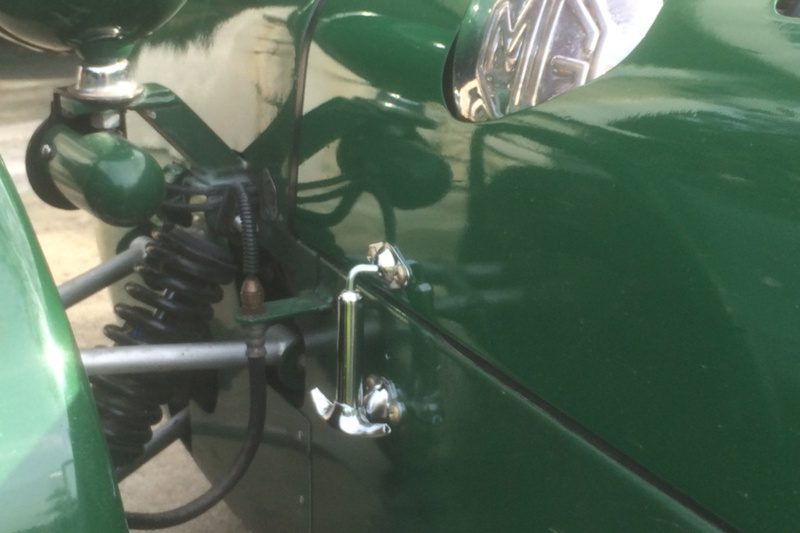 As a complement to the glossy paint we replaced our giant black front hood latches with giant chrome ones. We originally got black because the latches are huge and we didn't want people to see them, but now we think the chrome is more period-correct. 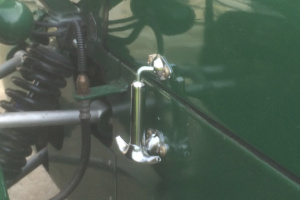 Fortunately we only need these huge latches on the front of the hood. 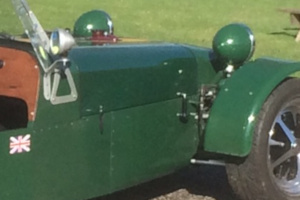 Our considerable experience with flying hoods has taught us that the rear latches are mostly a formality. When the hood lets go, the front end launches into the air first. If the front latches are tight, the hood's not going anywhere. So now we're down to a single project on the Locost, recovering the seats. We actually started doing this a year ago, and got as far as sewing the faces of the seats, complete with piping this time, and they look great. Unfortunately our cut-rate Singer sewing machine did not care a lot for sewing seams over thick piping, and the little guy now appears to be in need of repair. In any case the old seats are still doing the job, a little crumpled and stiff but not massively torn anywhere, so we're holding off on doing this last task, indefinitely if possible. If you don't hear from us for a while, or ever again, things are good.